Want to connect with Benjamin? 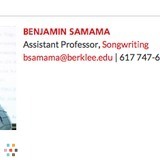 Hi I'm a professor at Berklee College of Music. Offering professional level private voice and songwriting classes in New York City.